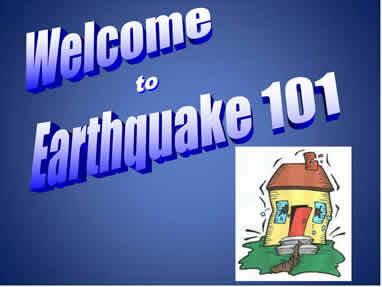 Earthquake Preparedness 101 - Best quality emergency kits, supplies and gear for the home, workplace and your car. An earthquake is a sudden, rapid shaking of the earth caused by the breaking and shifting of rock beneath the earth’s surface. Earthquakes strike suddenly, without warning, and they can occur at any time of the year, day or night. While most of the larger earthquakes in the US occur along the West Coast United States actually forty-five states and territories in the United States are at moderate to very high risk of earthquakes, and they are located in every region of the country. Are You at Increased Risk from Earthquakes? Contact your local emergency management office, local American Red Cross, state geological survey or department of natural resources for specific information about your community’s risk. However, bear in mind: Mobile homes and homes not attached to their foundations are at particular risk during an earthquake. Buildings with foundations resting on landfill and other unstable soils are at increased risk of damage. Doorways are no stronger than any other part of a structure so don’t rely on them for protection! During an earthquake, get under a sturdy piece of furniture and hold on. It will help shelter you from falling objects that could injure you during an earthquake..
Identify safe spots and danger zones in each room. Buy a large garbage can to store bottled drinking water, canned and dried non-perishable food that does not need to be cooked (tuna and crackers, for example), a can opener, flashlights, first aid supplies, battery powered radio, seasonal clothing and blankets. It may also become your “go kit” if you need to leave your home. Know how to shut off all utilities. Be sure your house is firmly anchored to its foundation. Store bottled foods, glass, china and other breakable items on low shelves or in cabinets that can fasten shut. Place large or heavy objects on lower shelves. Brace bookshelves and heavy furniture to walls to keep them from toppling. Install flexible lines to water heaters, gas stoves and other appliances. Securely fasten water heaters and gas appliances to wall studs. If indoors – take cover under sturdy furniture or against an inside wall. “Drop, Cover and Hold On” until the shaking stops. This means DROP down to the floor, take COVER and protect your head and neck with your arms, and HOLD ON to the sturdy piece of furniture you are under until the shaking stops. If outdoors – stay there. Move away from buildings, streetlights and utility wires. In a high-rise building – take cover under sturdy furniture away from windows and outside walls. Stay in the building on the same floor. An evacuation may not be necessary. Wait for instructions from safety personnel. Do not use elevators. In a vehicle – stop as quickly as safety permits, and stay in the vehicle. Avoid stopping near or under buildings, trees, overpasses or utility wires. If the electricity is out – use flashlights or battery operated lanterns. Check the main utility panel. If you smell gas or hear a hissing sound – open a window and leave the building. Shut off the main gas valve outside the building. If water pipes are damaged – shut off the water supply at the main valve. Check household appliances for damage. Clean up spilled medicines, bleaches, gasoline and other flammable liquids. Do not flush toilets until you know sewage lines are intact. Open cabinets cautiously because objects may fall off shelves. Listen to news reports for the latest emergency information.